A presentation from March, 2000 by Mark Knipping. 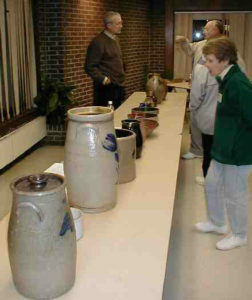 Mark Knipping of the State Historical Society of Wisconsin brought some of his stoneware collection to the WPA meeting, and demonstrated, perhaps inadvertently, that stoneware collectors don’t mess around. In case you think you like stoneware and might try to pick up a piece at a sale here or there, you might have reconsidered after hearing Mark’s talk. It seems that the stoneware collectors are an extremely dedicated group, driving miles to sales, at all hours of the day or night, for a chance to add to their collections. What makes them do it? Mark began his talk by explaining that potters learned early on that Wisconsin’s soil was not really suitable for stoneware or earthen-ware. And that it was easier during the mid-19th century, to take the potter to the clay than the clay to the potter. Due to limited means of transportation back then, moving materials such as clay around was simply not practical. But there was stoneware and earthenware produced in Wisconsin, and Mark explained the distinctions between the two potteries and production times. The earliest pieces produced in Wisconsin, were earthenware pots. 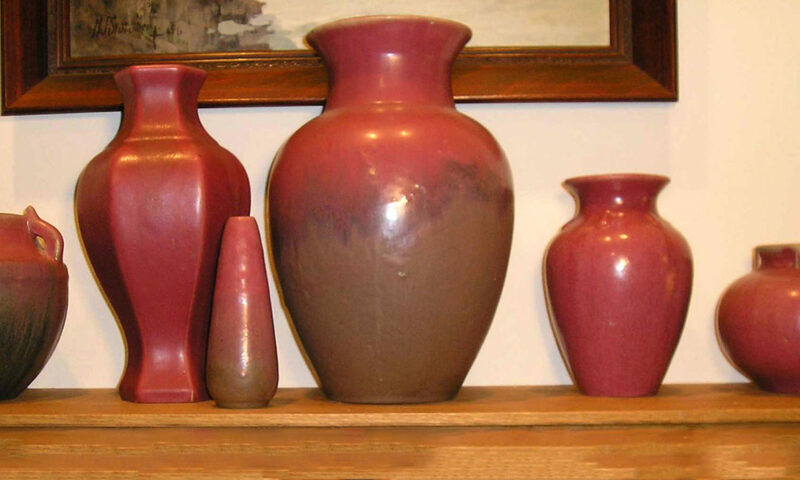 Made of red clay, this product is also known as “red-ware”. 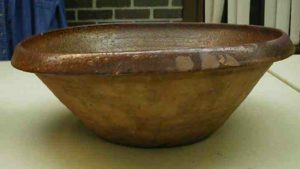 It is traditionally glazed on the inside only, as the Wisconsin clay resulted in a porous pot that would not hold liquid without the glaze, which served as a sort of lining. Along the shore of Lake Michigan clay could more easily be transported, which meant that potters didn’t have to rely so much on the local supply and soil type. Thus Wisconsin stoneware was born. Pieces from as early as 1840s have been found. Mark pointed out that they differed from earthenware in that they tended to be made by factory, versus smaller home-based businesses for earthenwares. Mark pointed out that the shape of some pieces helps tell their production dates. 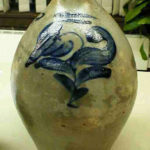 The earlier, 1840s jugs had sloping, less defined shoulders, while the turn of the century brought the “beehive” shape, with sharply defined shoulders. There are serious quality differences between stoneware and red-ware. 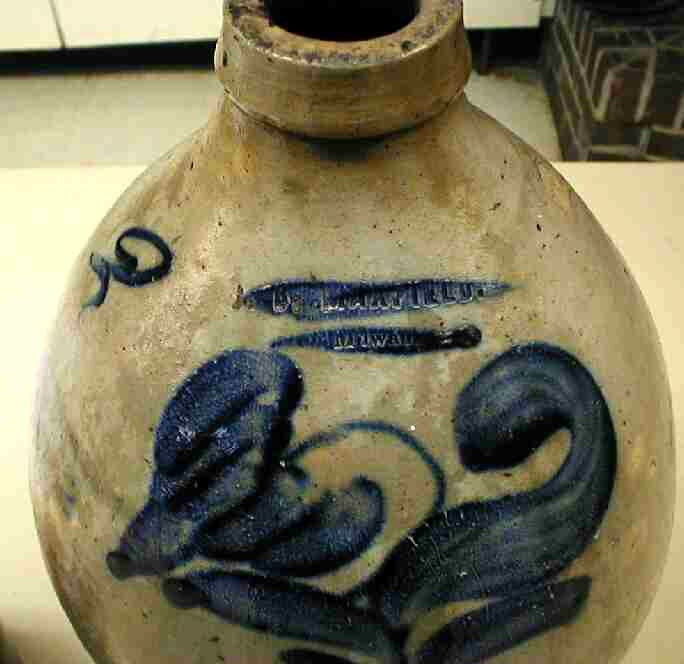 Redware was fired at about 1700°F, while stoneware was fired much higher, perhaps 2700°F. The higher firing temperatures vitrified the silica in the clay, literally turning it into glass. Thus stoneware is nonporous and holds liquid. 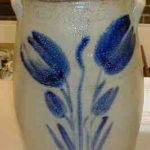 The early stoneware producers were commonly German immigrant as tells a common motif on stoneware, the tulip, popular in Germany as a design element. If you see a stoneware piece with a tulip flower (and this design appears to have been rather liberally interpreted in some cases, with flowers hardly recognizable as tulips in many cases) you can be fairly certain that it is a German potter’s handiwork. & others brought to the March 2000 meeting. The heyday for stoneware manufactured in Wisconsin was 1848-1875, with the Redwing company firing up their stoneware kilns and production about 1862. It was interesting to learn that Redwing shipped it’s stoneware all over the country, so Redwing Stoneware has a very large US-wide collecting market. 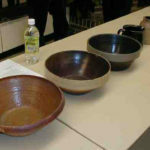 It is very possible, and even believed by some, that Redwing drove a number of other stoneware producers out of business. In his dissertation on Wisconsin Pottery in 1972, Mark Knippen identified 248 potters who worked at approximately 40 kilns. He found a lot of his data by going through the 1850 through the 1890 census data looking for people who identified themselves as potters. A question that could be answered from this data was if the person created pottery or was just in the business. Thanks to Mark for his fascinating presentation on very old Wisconsin pottery! The hand-thrown earthenware bowl above was made in Sheboygan, Wisconsin. As you can see, the bowl melted irregular in the kiln. This was due to the poor clay found in Wisconsin. 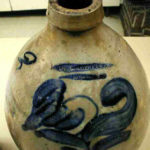 Earthenware was produced from the local clays. Earthenware is porous verses stoneware which is vitreous. 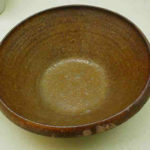 Stoneware is made from clay brought in from other states & mixed with sand. Local potters would add local clays to stretch their supply of clay. 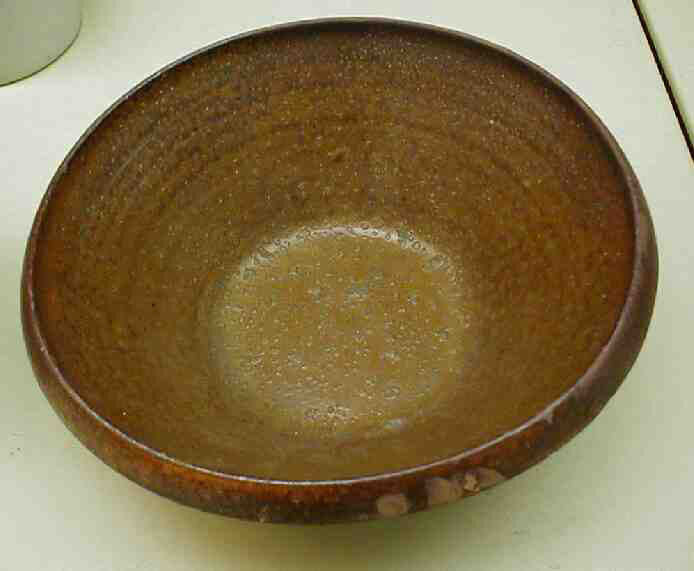 The piece above has a lead glaze to reduce absorption. The two pieces of earthenware were made by Conrad Londenberg (sp?) who sold to 20 stores in the Sheboygan area, which he haul in a cart from store to store. He also sold pottery from his house. He started selling in 1856 & was still selling in 1893. He died in 1899. These are two ‘flip’ jugs. With a flip of the wrist someone can separate or remove the cream that had risen to the top of the jug of fresh milk. 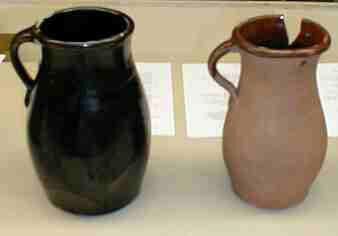 To the right is the earlier earthenware jug made in Sheboygan with a lead glaze. 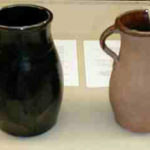 On the left is a stoneware jug with an Albany slip glaze. 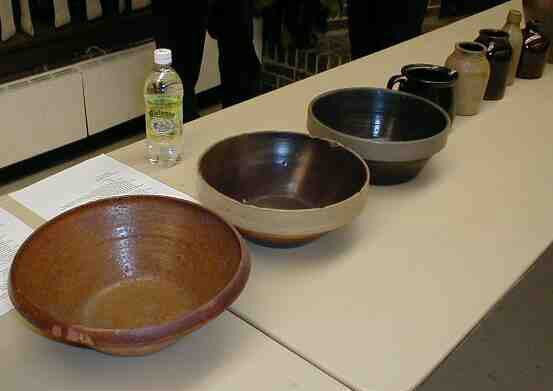 The earthenware bowl along with two hand thrown stoneware bowls. The two bowls neatly stack on top of each other. The inside you can see the potter finger’s indent & the outer side is smooth from using some tool. 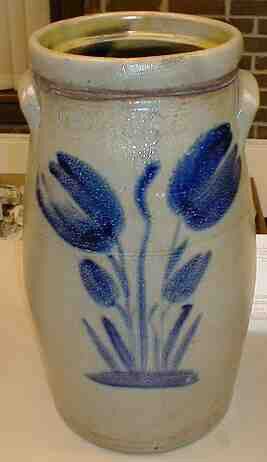 This churn has an identifiable flower motif of tulips. Tulips were a very common motif of German heritage. 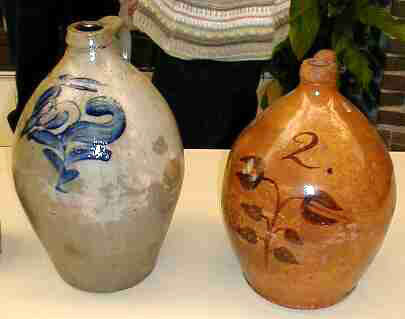 On the left is John B Maxfield jug & on the right is a Whitewater Pottery ware. 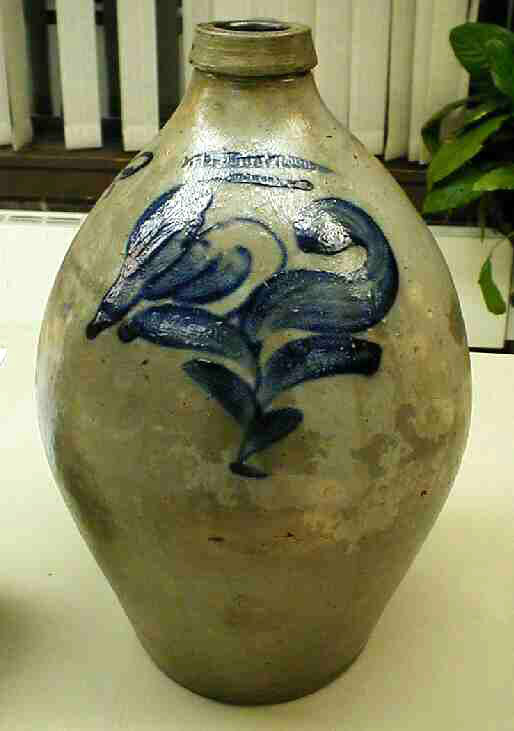 The jug is marked “John B Maxfield – Milwaukee”. Maxfield started production as “John & Amos Maxfield” in 1853. Later it became “John B Maxfield” in 1856. Another picture of the John B Maxfield jug. 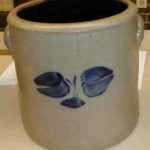 The stoneware crock above with the Albany slip interior is marked “T Guenther – Sheboygan”. This was made by Theodore Guenther who got his clays from the east coast. 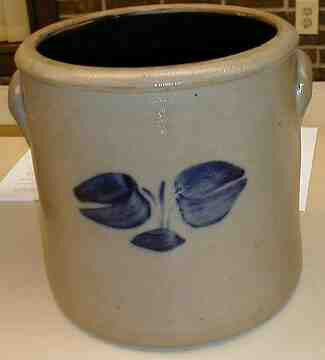 The crock & the two churns above & the two jugs below are salt glazed. Salt would be thrown in the kiln where it would vaporize & then coat the pottery with a clear coating. The blue designs were done with cobalt salts. The brown jug below used magnesium to create that color. 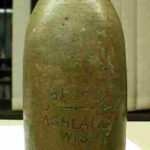 Mr Bottles – Has an extensive listing of over 100 clay beer bottles made in Wisconsin from 1850 until the turn of the century. The listings include name, location and pictures of many. 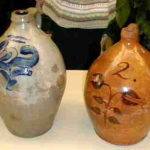 Be sure to read the introduction to clay bottles because it contains information about how they were made, of what materials, the markings and much more. 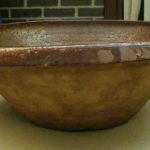 Recently added were pictures of Wisconsin Antique Stoneware. Outside of a Red Wing convention, the possibilities of seeing this many examples of Red Wing identified doesn’t happen very often, except in books. The 2002 Exhibit display had several rare Red Wing pieces & an example of every line of Red Wing’s dinnerware.